This is not a piece for the faint hearted animal lover. However, this is history, and the past is another country. We look at the past, can do nothing about it but we must learn from it, that is just the way it was – then. The sun rose on the morning of the 6th of June pregnant with the unknown events of an otter hunt that day on the Perry. The muster place was Fitz about 6 miles N.W. from Shrewsbury and the pack that belonged to the Hon. Rowland Clegg Hill.MP., which has earned a well deserved fame for its many gallant exploits. 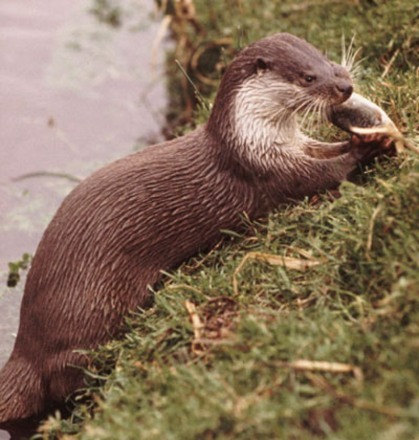 If the most ardent otter-hunter had had the management of the weather, he could not possibly had turned out a day better suited for the purpose; and however greedy or great his appetite for sport, he could not have wished a more exciting chase, or found a single fault with the plucky staunch and gallant hounds we followed. The only regret was that the noble owner was detained by Parliamentary duties from partaking of that sport for which he has so keen and thorough a relish. The pen-painting of an otter-hunt must of necessity be feeble in its colouring, as the thousand little incidents which make up the sum of glorious excitement are quite impossible to portray. In the absence of the noble owner Mr. H. Shaw of Shrewsbury, assisted by John Boylin, the huntsman, hunted the dogs, and intended first to draw a wooded byelet on the Severn, noted for a safe find. He, however having reason, changed his mind, and proceeded up the Perry. Opposite to Baschurch a stale drag was hit but soon abandoned. We then pursued our way upstream until we reached a large osier-bed opposite to Ruyton. 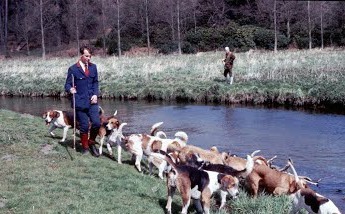 Here a good fresh drag was struck and away we went merrily to the tune of the deep melodious challenge of the hounds, which echoing through the densely wooded and picturesque valley sent up the joyous and harmonious music such as the hunter’s soul delighteth to hear. Away past the Drumbles then skirting Boreatton Park, though the low flats, we reached Wykey’s Weir. Here it was apparently the wily “crittur” was non est, and that we had been hunting heel. Accordingly, we soon went on the back track; but John Comberbach’s bait of luncheon was too tempting to be resisted. Our appetites appeased, and our frames re-invigorated with draughts of as glorious Shropshire ale as ever was a smack from the lips of a Saxon we started again in prime trim, still downstream, until we reached the osier-bed opposite which we started from, when suddenly the hounds struck on him again close to his kennel and push him up. John the huntsman and others viewed him stealing towards the river. By this time Ruyton had turned out its population-man-women-and child; and a scene of such excitement was improvised on the spot as to put the actions of devotees mat a liquefaction of St. Janarius (6thC Bp. of Naples, he hid his fellow Christians and prevented them from being caught & persecuted. A supposed sample of his liquified blood is kept in Naples) into the shade. Many knew the names of the dogs. The frantic cries of “Here he is! “ “There he goes! “And “Here, here, stop him”, “Mind down there Jack!” – “Look out Harry!” – mingled with “Have at him Pilgrim,” “Hoo in Caster,” with a chase of sounds joined to a rushing and frantic crowd, must be grouped into scenic effort by the reader , it being impossible to describe it . Poor John was completely flabbergasted and turned at bay in his circles at his vain attempts to control either the swaying crowd or the wildly excited dogs Although old Charlie Alexander, who, in days gone by, had often sounded the joy note at the death, attempted with all his “downy” skill to hit off the drag, it was vain; and the hounds were prudently drawn off until something like order was restored – the Ruytonians, with suppressed excitement, every moment threatening another frantic outbreak. The osier-bed, whence the “varmint” was pushed, was bounded on the landward back by a deep broad ditch filled with reeds and rushes, which sluiced the river higher up and served to convey flood water to this part when the river freshened (flooded): but more of the *** order having been restored the dogs were again laid on, and we hunted upstream, believing our game to lie in that direction, to and fro, in and out, the gallant hounds steadily and determinedly working to their prey, but for a long time in vain. Suddenly old Tramper struck the trail hot and fresh, where the ditch above mentioned, started from the stream. The cunning beggar had stolen a march upon us, and fresh, where the ditch above mentioned, started from the stream. The cunning beggar had stolen a march upon us, and during the hubbub at the osier- bed had quietly slipped up the ditch and gained the upper water His circumventing tactics were rapidly drawing to a close. Away we went in savage earnest, the hounds in full cry, and all at a tremendous pace The burst was only for about 200 yards , when the otter was put down under an old wooller stump, (probably willow stump) which proved of no protection, the game being too much alive for any peace. Finding his place of refuge attacked and himself hard pressed, he again took up water chaining (leading on) in glorious style, the hounds still in full cry. Down again under another stump, when the dogs in their excitement, over ran him but not far – the chase becoming by this time too hot for many mistakes. Dislodged again, he chained then downstream, and came in contact with old Charlie Alexander’s son, who, standing mid-body in the water to prevent him again reaching the osier-bed, he probably mistook for a friendly stump. A desperate grapple worthy of his father; for although he was immediately bitten through the hand severely, he stuck to his work, and refused to let go. Up came old Tramper and Castor, and a regular “pull devil pull baker” (a closely fought see-sawing contest) scuffle ensued until all went under, floundering in the mud. Up again –the appearance of the man a fine study to represent an uncombed merman, his long hair being mudded and matted, so as to entirely hide his face. We were by this time within a few yards, coming up at full speed; hand over hand, with breath bitten in. When a cautious, but jolly butcher joined in the melee, and seizing the “varmint” by the pole, (or poll, head) plucked him on to the bank, where the terrible fight was renewed by the quadrupeds along with determinated ferocity. The otter, although fighting fiercely with all his tenacity of life, stood no chance against the united assault of the noble hounds. His time was come, and he died game as a wolf dies, without a whimper, fighting savagely to the last. Thus ended his piscatorial maraudings – He proved to be a splendid dog otter and on being weighed at the Clive Arms, (Powis Arms, now Powis House, Church Street) Ruyton to which we immediately adjourned, was found to weigh 25 lbs . Here having devoted a few glasses of brandy- and –water to his manes (Roman souls of the dead) and our exhausted bodies, we closed our day’s sport, which will be long remembered with glee by all those who were fortunate enough to have been present. The Otterhound hunts its quarry both on land and in water and it has a combination of characteristics unique among hounds; most notably an oily, rough, double coat and substantial webbed feet. They can sustain many hours of hard work and have a nose that can track in the mud and water for over 72 hours. In 1977 nine registered packs of otterhounds were still in existence but the sport was banned in 1978. A few hunts switched to hunting mink or coypu, but many of the original otterhound packs hunts ceased to exist altogether. Hounds were often passed to newly founded minkhound packs.